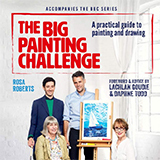 The Big Painting Challenge is a TV show on British national television from BBC1 with an average rating of 3.3 stars by TelevisionCatchUp.co.uk's visitors. We have 18 episodes of The Big Painting Challenge in our archive. The first episode of The Big Painting Challenge was broadcast in November, 2018. Did you miss an episode of The Big Painting Challenge but don't you wan't that to happen in the future? Please set an alarm and add The Big Painting Challenge to your favourites, so we can remind you by email when there's a new episode available to watch. For free! May 6, 2018 of the TV-show The Big Painting Challenge was broadcast by BBC1 on Sunday 6 May 2018 at 18:00. April 29, 2018 of the TV-show The Big Painting Challenge was broadcast by BBC1 on Sunday 29 April 2018 at 18:00. April 22, 2018 of the TV-show The Big Painting Challenge was broadcast by BBC1 on Sunday 22 April 2018 at 18:00. April 1, 2018 of the TV-show The Big Painting Challenge was broadcast by BBC1 on Sunday 1 April 2018 at 18:00. Mariella Frostrup and Rev Richard Coles host the semi-final of the amateur painting competition, and the five remaining artists are facing their toughest challenge yet - capturing the human body in movement. With the winning post in sight, the amateur artists have two nail-biting challenges remaining. With Mariella Frostrup and the Rev Richard Coles overseeing proceedings, it's the last chance for the finalists to impress the judges with everything they've learned throughout the series.